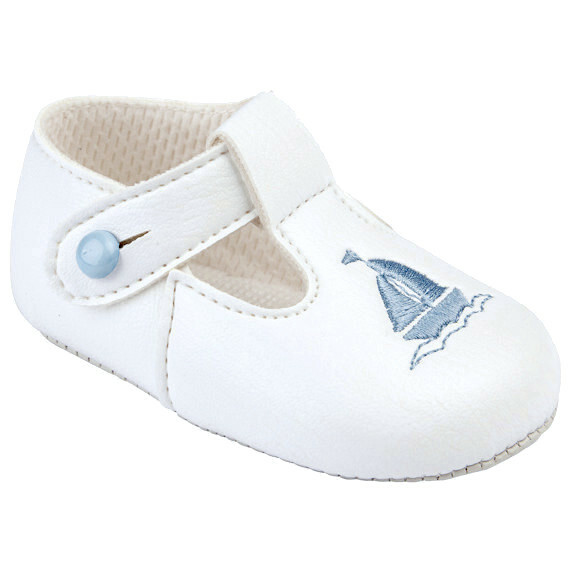 Baby boys white & sky blue sail boat pram shoes, perfect for your baby boys christening day, attending a wedding or simply a special occasion or party. These lovely baby boys shoes are of a plain white matt leather look. They have a beautiful embroidered sky blue sail boat at the front with a sky blue button fastening to the side and a soft and flexible sole. Complete with all inside shoe packaging to keep the shoe in shape and a plastic presentation box to keep the shoes in perfect condition. These are a perfect compliment to our 4 piece baby boy christening suits and sailor style rompers. Absolutely darling shoes that matched outfit perfectly. Service was second to none. Highly recommend & will use this website again. Adorable little soft baby shoes! Fast delivery and an excellent price for baby shoes. Will certainly use this company in future and highly recommend them. Perfect Fit!! Gorgeous little shoes, very pleased with service as well!